St. Elias Stable's Grade 1 Carter Handicap winner Army Mule arrived Thursday morning at Todd Pletcher's barn at Saratoga, where he will continue training for a fall campaign, according to his conditioner. The 4-year-old Friesan Fire ridgling has been out of action since winning the seven-furlong Carter by 6 ½ lengths on April 7 at Aqueduct Racetrack. He earned a 114 Beyer Speed Figure for the victory, his first stakes attempt. In May, Army Mule was withdrawn from consideration for the one-mile G1 Metropolitan Handicap for a freshening. Pletcher said Army Mule returned to training while at James Crupi's New Castle Farm in Ocala, Florida, and noted that the connections expect to take their time with the lightly raced Pennsylvania-bred. 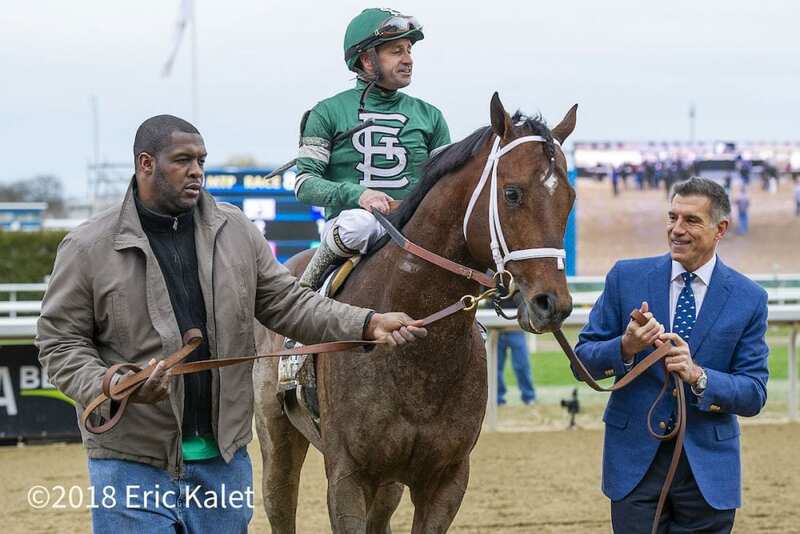 Pletcher and Vinnie Viola of St. Elias hope Army Mule's fall campaign will culminate in the Breeders' Cup November 3 at Churchill Downs, with both the Dirt Mile and the six-furlong Sprint being solid options. A perfect 3-for-3, Army Mule was an $825,000 2-year-old in training purchase. He debuted as a sophomore and won by 8 ½ lengths at first asking in April 2017. Army Mule returned the following January to earn a 104 Beyer with a 7 ½-length optional-claiming score prior to his Carter victory. This entry was posted in Breeders' Cup and tagged 2018 breeders' cup, army mule, st. elias, todd pletcher, vinnie viola by NYRA Press Office. Bookmark the permalink.